The title of this guitar lesson should include the word "modes" in it. For one thing people want to learn about modes and that's what, mostly, its about, but it also has a second half devoted to the harmonic minor scale and then a further long section introducing the concept of secondary dominants. See below in the menu. Modes! Wow! Scary! But I am liking what I see and loving what I hear too. According to our instructor Santana uses the second mode, the Dorian, for most of his songs. This particular mode is one we are introduced to early on in this lesson! 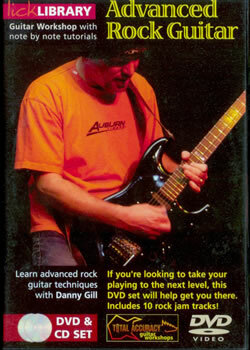 Its one of the 'easier' modes and probably the main reason to purchase this guitar lesson. It offers some practical application for you. The metal mode, Phrygian is the next reason to delve into this no-non-sense series of guitar lessons! Its hard work from there on boys and girls! As far as modes go generally just by changing just one or two intervals or notes of the major scale you are in a different mode. Jeepers if you think modes are scary wait until you get to the secondary dominants. The 5 of 2, the 5 of 3 and more fun concepts! Its good (mandatory) for you to know what the major scale is and its surrounding theory. You definitely have to start somewhere with theory if you want to understand music and learn to play the guitar. The major scale is where everyone starts. I avoided it for years. I was ill advised. That's where you should start and the sooner the better for many reasons not just this particular advanced look at it. To the best of my knowledge the late J.J. Cale made a whole career and wrote some amazing tunes without using modes but I am sure he could have if he wanted to. On the other hand he, and everyone else, uses the major scale which is the same thing as the Ionian Mode.